Microscan will demonstrate LVS® barcode verification solutions at the UDI Conference, April 18-19 in Baltimore, MD. Microscan, a global technology leader in barcode, machine vision, verification, and lighting solutions, announces that it will demonstrate LVS® barcode verification and print quality inspection solutions from Booth #20 at the UDI Conference, April 18-19 at the Hilton Baltimore in Baltimore, Maryland, U.S.A.
With Microscan’s 25 August 2015 acquisition of verification systems innovator Label Vision Systems, Inc., (LVS), Microscan’s technology portfolio now includes a comprehensive suite of all-in-one, standards-based verification products to ensure barcode structure compliance and print quality on device labels. 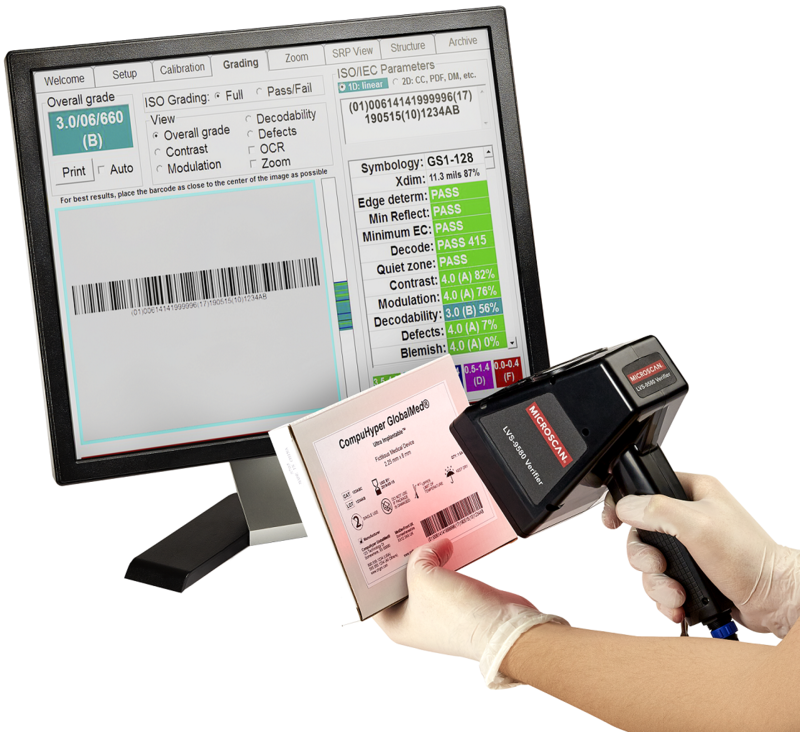 Microscan off-line barcode verifiers enable users to test newly-designed labels for quality and compliance issues before printing, while Microscan in-line verification systems can be integrated into manufacturing lines and printers to check label quality on the fly during label application. In off-line testing, LVS Barcode Verifiers parse and evaluate codes for data structure accuracy, applying the appropriate GS1, HIBCC, or ICCBBA specification tables for the selected device class and application and highlighting problem areas or missing elements in code structure that cause noncompliance. These verification solutions address the growing need for compliance to the FDA’s Unique Device Identification (UDI) rule, as well as other regulated barcoding and product serialization standards. In addition to hosting booth #20, Microscan will lead a live demonstration as part of the AIM North America Healthcare Committee during the UDI Conference. “The Auto ID Technologies & In-House Systems for UDI Compliance” will be co-presented by former LVS CEO Tim Lydell on March 23, 1:45 P.M. to 3:15 P.M. This course will guide users on understanding auto ID technologies and will cover topics such as how to create codes, how to get them onto a label/tag, how to access the data, in-house systems functionality, and how these technologies can provide additional benefit to organizations beyond complying with the UDI Regulation. For more information about Microscan, please visit http://www.microscan.com or at Booth #20 at the UDI Conference. Microscan’s dedicated LVS product team will be available throughout the show to discuss print quality and verification challenges with visitors to the Microscan booth. Microscan is a global leader in barcode reading, machine vision, and verification technology serving a wide range of automation and OEM applications. Founded in 1982, Microscan has a strong history of technology innovation that includes the invention of the first laser diode barcode scanner and the 2D symbology, Data Matrix. Today, Microscan remains a leader in automatic identification and inspection with extensive solutions ranging from barcode reading, tracking, and traceability up to complex machine vision measurement, guidance, code verification, and print quality grading. As an ISO 9001:2008 certified company recognized for quality leadership in the U.S., Microscan is known and trusted by customers worldwide as a provider of quality, high precision products. Microscan is a part of Spectris plc, the productivity-enhancing instrumentation and controls company.